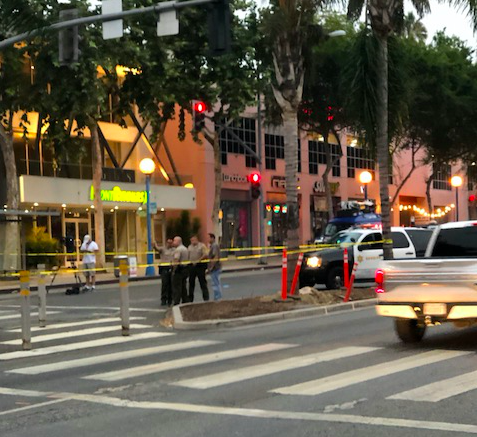 A pedestrian was struck by a car at around 3 a.m. today while in the crosswalk on Santa Monica Boulevard at Westbourne. The pedestrian, a woman in her 30s whose name is not available, was taken to Cedars-Sinai Medical Center. Her condition is unclear. A woman at the West Hollywood Sheriff’s Station who identified herself as Sgt. Hewitt confirmed the details above provided by WEHOville but declined to give any more information about the incident, saying it remains under investigation. Eric Jon Schmidt, a candidate in the March election for City Council, provided the photos above of the scene, which would indicate that the crosswalk where the accident occurred is the one extending from the LASC store on the South to the block where Starbucks and Kitchen 24 are located to the North. Correction: An earlier version of this story said the accident occurred on Santa Monica Boulevard near Westmount. It occurred near Westbourne. The story has been corrected. Check the location, please – that is not the cross walk near Starbucks. So sorry to hear of this terrible accident. My problem as a driver at this corner is the blinking yellow light that stays on while you are waiting to turn left onto Westbourne. The intersection is very dark at night, and my fear is somebody hurrying to turn left during a break in oncoming traffic is not going to see somebody jaywalking west across Westbourne. It seems like a tragedy waiting to happen. Please be careful crossing the street! Don’t ever assume you are being seen. That’s not true.. Marina has not passed away. She’s in very critical condition. Someone was just there in the hospital with her 2 hours ago. I think these new crosswalks can be just as dangerous as the old ones. Now, the cars have the right of way if they have a green light. Yet ignorant pedestrians think they have “a right” against law and physics to step out at a do-not-walk signal in front of oncoming cars. There should be a sign telling these ignorant pedestrians to cross only when they have a walk signal. Sadly, some adults think that what they were taught about traffic lights in kindergarten or preschool was just made up nonsense from adults who wanted to bother children with things that were wrong. That is not the Starbucks crossing. The accident occurred one block west of the one identified near the 24 hour gym. I see people crossing when they want, green walk sign, or not. At 3am, lots of things seem to happen. I mean, there would be no traffic at that time, so these kinds of things should not even happen. I also see people in the cross walks who did not push the button for the walk signal. They think that if they are in a crosswalk, they have the right of way, which is true, but not a smart assumption without a green walk sign. I live nearby. The reconstruction of the lights and new pedestrian signals was amazing, much needed, and works very well. For the most part. One element that still surprises pedestrians is when the light changes they don’t get the immediate go ahead. Instead the northbound traffic turning from westbourne to SMB, right and left, gets the green light. After that, the pedestrian walk light turns. This is the opposite of how it was for decades. Many of us, right or wrong, as used to watching the opposite red oight click in and then we think we can go. Now, this isn’t a major intersection like LaC/SMB where the left turn lanes need to be alternated (westbound goes first, then at the end Eastbound goes..) there’s no reason they don’t flip this at Westbourne. I’ve even been behind a car that doesn’t understand this and stops in the middle of the intersection. help time the lights to mitigate that. I hope she is ok. I urge pedestrians to wave your hand when crossing so people acknowledge you. That’s what I do. The light may be FOR the pedestrian but the driver may not notice the pedestrian. Waving does help and saved my life many times!! !